30 Months in the making, Contains 40 pages booklet-Full liners notes with many super rare photographs handed to us by the musicians. 16 interviews conducted in various cities in Benin & Togo with artists and producers, reconstructing the history of the 70s music scene. ALL TRACKS OFFICIALLY LICENSED. Note : African Scream Contest will be available as a 14 tracks compilation CD and double vinyl. The compilation will be released in the UK on march 17th (thru GrooveAttack), in the US late May (via Stones Throw/Now Again) but DustyGroove will have them till official release date. Check the incredible mix offered to promote this compilation on www.parisdjs.com! 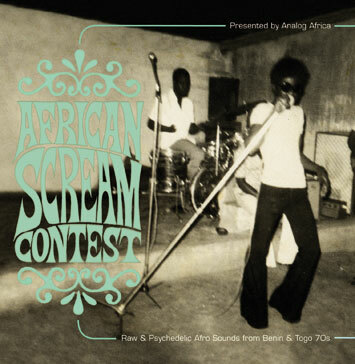 'African Scream Contest' is the third release by the Analog Africa label. The project initially took off in August 2005 when label owner and vinyl collector Samy Ben Redjeb arrived in Cotonou, Benin, "without any special expectations, just hoping to lay my hands on few good records - what I found in the process cannot really be described in words". This first trip was followed by eight more to the region. Thirty months and few thousand records later Analog Africa proudly presents this 14-track compilation (on CD and limited edition double vinyl). Ben Redjeb conducted 16 interviews in various cities in Benin and Togo with artists, producers and sound engineers to reconstruct the history of the 70s music scene for the 44 pages booklet which also features many rare photographs directly received from the artists. Like most modern music in French-speaking West African countries, the music of Benin and Togo was influenced by a few main musical currents: Cuban, Congolese and local traditional music, as well as Chanson Francaise. Additionally, the geographical location of Benin and Togo - sandwiched between Ghana and Nigeria - exposed Beninian and Togolese musicians to Highlife music. The cultural and spiritual riches of traditional Beninian music had an immense impact on the sound of Benin's modern music. Benin is the birth place of Vodun (or, as it is known in the West, Voodoo), and some of the rhythms used during traditional rituals - Sakpata, Sato, Agbadja, Tchenkoumé and many others - were fused to Soul and Latin music as early as the mid-1960s and later to Funk. That fusion is the essence of this compilation. What made this musical revolution even more interesting is that most of the musicians could not read music. Often the music they made sounded one beat away from being out of tune, but somehow they always managed to bring all the elements together into something new and exciting. One of the greatest bands of their era, Orchestre Poly-Rythmo de Cotonou, who are of course featured on this compilation, took the Afro sound to another level by showing their musical versatility in many forms. Although they were consciously copying western artists, they would always inject a dose of psychedelic Afro grooves that would make their music unmistakably Beninian. Their biggest song, 'Gbeti Madjro' is believed to have revolutionised the music industry in Benin in the 70s when the country went through a period of political turmoil. The song is full of raw breaks and the hypnotic rhythms as well as screams a la James Brown - after this song many bands in Benin started screaming on their recordings, hence the title of this compilation. Latin-influenced sounds are present on this compilation, too. Ouidah, a city on the Atlantic coast of Benin, is home to a large Brazilian community, or, as they are called in Benin, "Agoudas". Members of that community are descendents of slaves who returned from Brazil at the end of the 19th century. Their dances (such as Kaléta and Buriyanj) and songs are still being performed and fused into the traditional Beninian rituals. That, too, can be heard in modern Beninian music. The proximity of the giant neighbour Nigeria can be heard on the track 'Djanfa Magni' which features the amazing trumpeter/ saxophonist Tidjani Koné fronting the Orchestre Poly-Rythmo. Koné whose career started in Mali with the Rail Band de Bamako, of which he was the founder and the band leader played with Fela Kuti for a short while hence the Afrobeat influence. There are countless stories to be discovered in the extremely well-researched booklet and the music is truly mind-blowing. Delve into the forgotten raw and psychedelic Afro sounds from 70s Benin and Togo and experience the African Scream Contest.